This exquisite and unusual Fiddle pattern silver caddy spoon is hallmarked for Birmingham 1832 and bears the marks of James Collins. The shaped square bowl with waisted middle section engraved with acorns and foliage. The handle with vacant cartouche and stylised motifs. Date letter "I" for 1832. No tear to the bowl. Sign of old and nicely executed repair at the back. Bowl: 4cm x 3cm / 1.3 inches x 1.2 inches. This very pretty Georgian , Regency period, silver caddy spoon was made in Birmingham 1828 by the reputed Unite & Hilliard. The ovoid bowl bright-engraved with a flower head within a prick-dot border. The hollow handle engraved and initialled. Date letter "E" for 1828. Hollow handle with a minor crease/ding at the back as is often the case, hollow handles are prone to dents and dings. Bowl: 4cm x 3.5cm / 1.4 inches x 1.2 inches. This delightful George III silver caddy spoon was made by the very collectable female silversmith Elizabeth Morley and is dated London 1796. The leaf-shaped bowl bright-engraved with a veined centre, within a wavy prick-dot border. Very pretty tendril loop handle with a leaf-shape. Leaf-shape caddy spoons are very collectable and rather rare and this is a wonderful example by a female silversmith, dating pre 1800. Bowl: 6cm x 3cm / 2.2 inches x 1.2 inch. 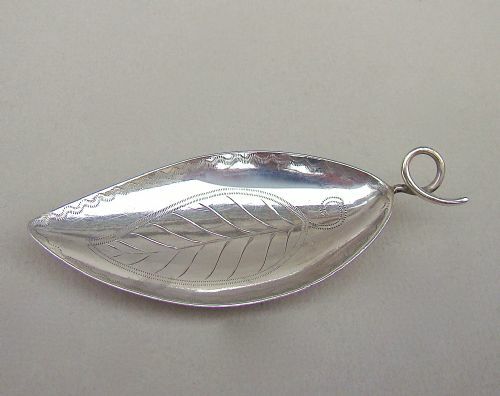 This delightful George III silver caddy spoon was made in Birmingham in 1808 by the renowned maker Joseph Willmore, the leaf-shaped bowl bright-engraved around a prick-dot veined centre. The unusual loop handle with a leaf-shape thumbpiece. 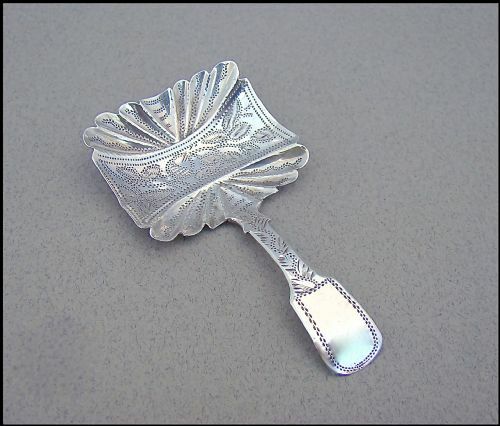 Leaf-shape caddy spoons a re very collectable and rather rare and thsi is a wonderful example. Date letter "k" for 1808. Bowl: 5cm x 2.5cm / 2 inches x 1 inch. 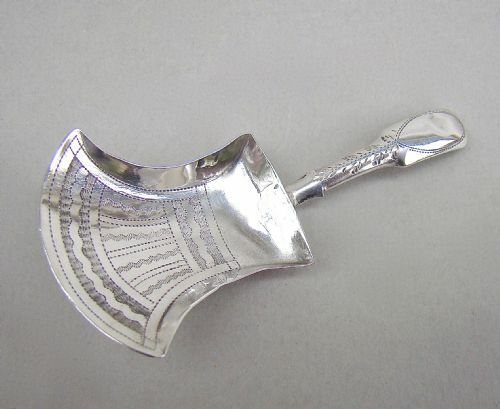 This delightful George III silver caddy spoon was made in London 1803 by Josiah Snatt. The ovoid bowl bright-engraved with seaweed patterns within a prick-dot border. The handle engraved with leaves. Bowl: 4.5cm x 3.5cm / 1.6 inches x 1.4 inches. 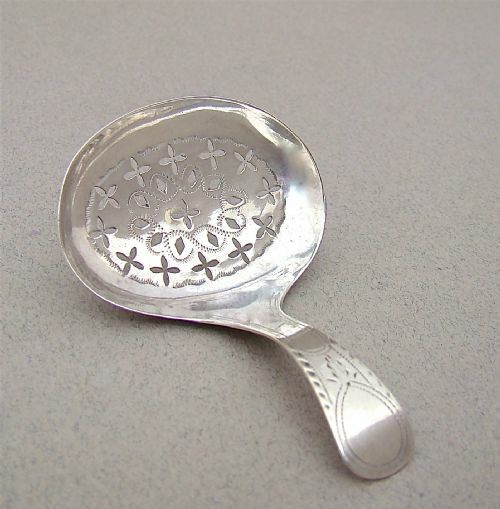 This delightful George III silver caddy spoon was made in Birmingham 1800 by Thomas Willmore. The oval bowl with bright-engraved borders and pierced with crosslets. Pierced caddy spoons are rather scarce and this is a lovely example in very good condition. Date letter "o" for 1800. Bowl: 4cm x 3cm / 1.5 inches x 1.1 inches. 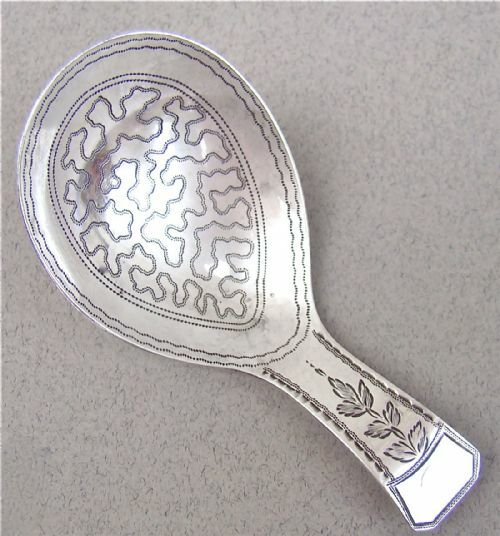 This delightful George III silver caddy spoon was made in Birmingham 1811. The shovel bowl bright-engraved with seaweed patterns within a prick-dot border. The hollow handle engraved with leaves. Date letter "n" for 1811. Hollow handle with a crease/ding , as is often the case, hollow handles are prone to dents and dings. 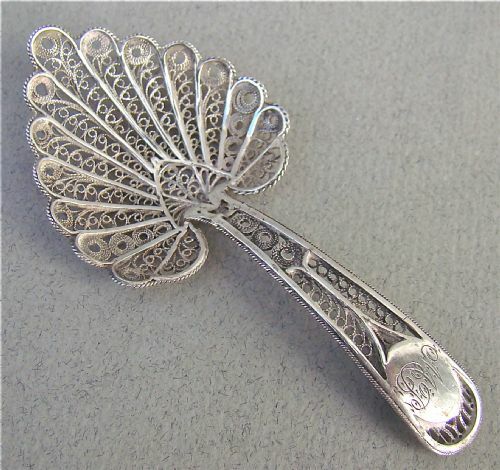 This delicate solid silver filigree caddy spoon dates circa 1800. It has a delightful leaf-shaped scalloped bowl. The handle incorporating an initialled oval cartouche. 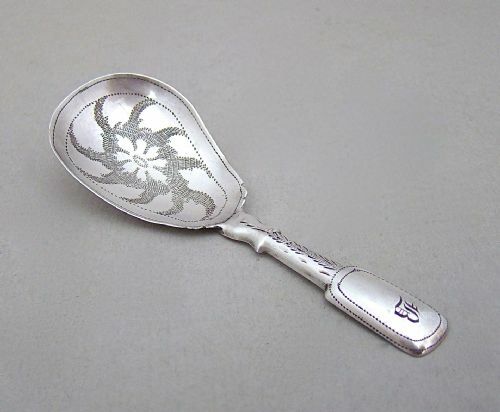 Unmarked as was always the case with filigree caddy spoons. 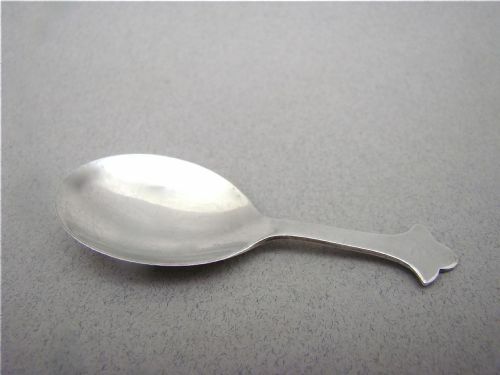 This type of caddy spoons dates circa 1800. No loss to the filigree work. There is a finely executed silver repair at the back, as can be seen in photo 3, This repair seems to have been done a long time ago and is beautifully done. The condition is reflected in the price of the spoon. 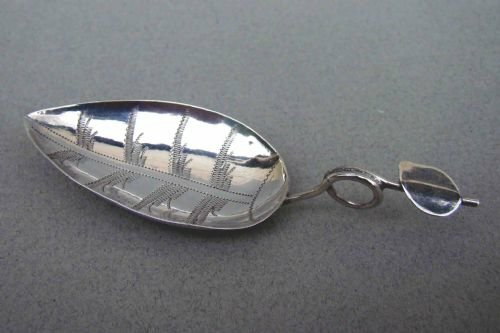 This is a very pretty silver caddy spoon made in Sheffield 1933 by the Cooper Brothers & Sons Ltd. The simple oval bowl with flat handle and trefid shaped terminal. Date letter "q" for 1933. Bowl: 3.5cm x 3cm / 1.2 inches x 1 inches.